Magazine Pro is a fresh and responsive WordPress wide mag theme from StudioPress developer club. 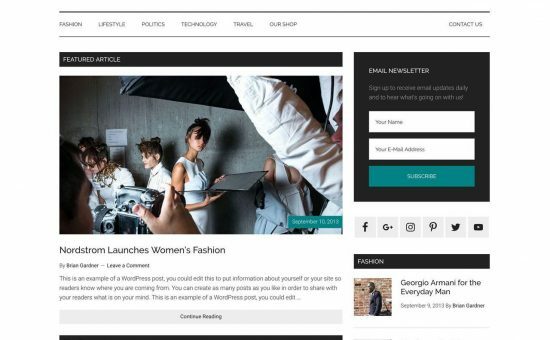 This theme would be a great choice for those who are planning to start a new magazine or heavy content-based websites. Magazine Pro theme design is a clean layout, well organized and planned for display your content out-of-box appearance like the biggest attractive view. Since it has been powered with Genesis Framework, you will have plenty of features like custom homepage that helps organize and the homepage is full and fully customizable as per your need like a featured latest entry from specific categories with large image banner, stunning photography, featured contents and much more. Responsive Layout Design – Support for iPhone, iPad, Tablets, BlackBerry, Android OS, iOS and other devices. Pre-built custom page templates for archive, landing page promotions, columns, blog and etc. Theme Options – Custom Headers, Menus, Featured Images and etc. Social Media Widget for Facebook, Twitter, Pinterest, Google+, YouTube, and etc.